Welcome to Down On The Street, where we admire old vehicles found parked on the streets of the Island That Rust Forgot: Alameda, California. It had to happen, sooner or later; somewhere on the island, a Cordoba was waiting- soft Corinthian leather and all- for my camera. Now that day has arrived, with this '78 located in the 1950s-vintage part of the island landfilled into the Bay. Generally, houses in such neighborhoods have garages, which means the DOTS pickings are much slimmer than those in the neighborhoods full of houses built during the 1880-1910 period, but this Chrysler still lives outside after 30 years. First, we must watch the Ricardo Montalban ad that started it all. In Cordoba, I have what I need! Plastic "gold" Cordoba medallions may be found all over this fine personal luxury automobile. Weighing in at a portly 4,021 pounds and motivated by a thirsty 318 or 360, the Cordoba wasn't quite the ideal machine for a time of fuel-price insecurity. 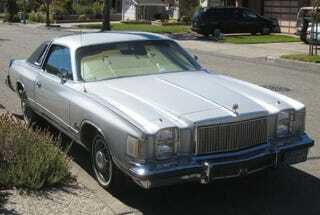 By '78, the stacked rectangular headlights had taken away some of the Ricardoesque appeal, and sales were declining. Even the taillights had the medallions! I couldn't get any decent interior shots, so it's hard to ascertain whether this car had the optional Corinthian Leather upholstery. Yes, it was optional, though you have to assume that Cordoba buyers wouldn't have settled for vinyl.